1. Preheat the oven to 220ºC, gas mark 7. Place the crispbakes on a baking tray and bake for 20-22 minutes. 2. Meanwhile, drain the chick peas, reserving the liquid. Place in a food processor with the garlic, cumin, oil and 3 tbsp of the reserved liquid. Blitz toa coarse purée (houmous) and season to taste. 3. 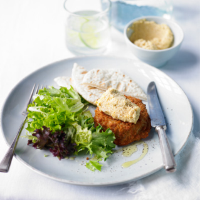 Spoon the houmous on top of the crispbakes and serve with salad, and pittas (optional).